Barely pulled back from the brink of extinction, California condors are still being poisoned by lead-based ammunition. A California condor, tagged so it can be monitored, soars over the Bitter Creek National Wildlife Refuge in California’s San Joaquin Valley. All the free-flying condors today either were raised in a captive-breeding program or descend from birds that were. Sitting on a high cliff along California’s Big Sur coast, three friends and I are scanning the horizon with binoculars for one of the world’s great birds. Kelp heads masquerading as sea otters and seals impersonating fat sausages lie far below, while turkey vultures soar above. It is an idyllic spot: spectacular views, crashing waves, sheer rocky cliffs, and a soft fog rolling in from the sea. All we need to make this a complete WOW moment is the sighting of a condor. After many “yes it is,” “no it isn’t” misidentifications, in the distance we see it. Too far to see a numbered tag but close enough to know that we have had the privilege of seeing one of the world’s wonders, the California condor. Weighing as much as twenty-five pounds, standing as tall as four and one-half feet, with a wingspan of about nine and one-half feet, the California condor (Gymnogyps californianus) is the largest land bird in North America. Riding on wind currents to heights of 15,000 feet and traveling up to 150 miles a day in search of food, these majestic birds once flew by the thousands above the California land mass and far beyond. 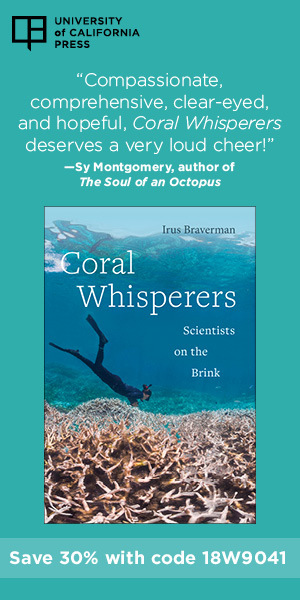 But then humans took a toll: egg and specimen collecting, the capturing of live birds, habitat loss and destruction, hunting, lead poisoning, and other assaults decimated the species’ numbers to the point of near extinction. Critically endangered, California condors were granted federal protection in 1967. It was becoming clear, however, that some extraordinary measures were needed if they were not to vanish altogether. After many discussions and legal tussles, and with much trepidation, between 1982 and 1987 the remaining freeflying condors were taken from the wild. By adding them to other condors already in zoos, this action maximized the gene pool for a captive-breeding program. By 1987, there were twenty-seven in captivity, including ten adults and four chicks captured from the wild, and thirteen birds successfully hatched from eggs. From April 1987 through 1991 the North American skies were empty of condors. In 1992, captive-bred offspring, often fed using condor hand puppets to keep them from imprinting on humans, began to be released into the wild. Today, 219 condors inhabit the skies above California, Arizona, Utah, and Baja California, including chicks fledged from natural nests by breeding pairs that formed after release. A further 200 are in zoos, captive breeding programs, or being held for release or medical treatment. Fortunately, sufficient habitat still remains in California and the Southwestern states to support a large number of condors. Unfortunately, a major human hazard still hangs over the condors: lead poisoning. From 1992 until the end of 2012, there have been nearly 200 condor deaths in the free-flying population. Of the 123 where cause of death could be determined, 42 (34 percent) were due to lead poisoning. Myra Finkelstein and a team of environmental toxicologists at the University of California, Santa Cruz, found that half of the free-flying condors in California tested between 1997 and 2010 had blood-lead levels that indicated poisoning and the need for clinical treatment. In addition to blood samples, Finkelstein and her colleagues also analyzed lead in feathers. Because feathers grow over a period of several months, sampling sequentially along the length of the feather gives a record of the bird’s history of lead exposure. Analyzed feathers showed that the incidence of lead poisoning is much higher than previously believed, and that the amount of lead exposure is probably much higher than indicated by periodic blood monitoring. 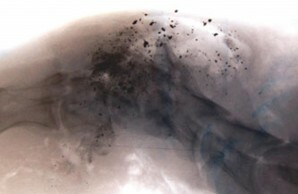 An X-ray image of the neck of a mule deer that was shot with a lead rifle bullet shows more than 450 lead bullet fragments (dark spots). Just a few fragments contain enough lead to sicken or kill a California condor. Where does the lead come from? Both legitimate hunters and poachers use lead ammunition to kill animals, and condors, being opportunistic scavengers, often feed on carcasses and gut piles left behind by the shooters. Easily overlooked is that as part of livestock management ranchers commonly shoot “downer” animals, those that because of illness or injury cannot be taken to market. Depending on where that occurs, those carcasses may also pose a hazard. Lead bullets fragment upon impact, increasing the likelihood that a scavenger may accidentally ingest lead. Since condors feed in groups, one contaminated carcass could poison many of them. Condors are not the only species thus threatened: bald and golden eagles, ravens, turkey vultures, and at least another seventy wild bird species may be exposed to lead in this way, as are many other scavenger species, pets, and even humans. 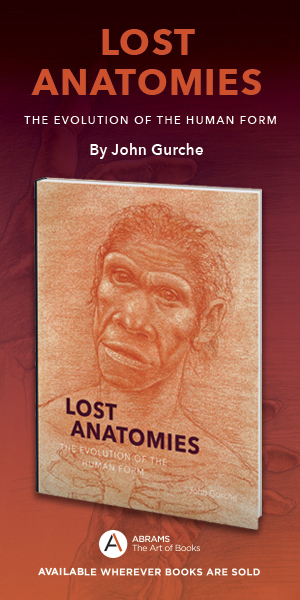 After a condor ingests lead, this toxin finds its way into the bloodstream and vital tissues. Once absorbed, the lead can cause a number of significant health effects, including anemia, neurological impairment, and kidney damage, and ultimately may prove lethal. Typically, the treatment for a poisoned condor is to capture it, transport it to a zoo or veterinary hospital, treat it with chelation therapy—the intravenous administration of chemicals that bind lead so it can be excreted from the body—and give the bird supportive care until it is healthy enough to be returned to the wild. The whole process can take up to a month, if not longer, and is extremely expensive and labor-intensive. Chelation therapy is hard on the condors, and the treatment may not succeed. The National Rifle Association (NRA) disputes the view that lead ammunition from gut piles or game carrion left in the field by hunters is the primary source of lead exposure to condors. They claim that “there is compelling evidence of alternative sources of lead in the environment. Such alternative sources of lead include paint chips from old buildings, legacy leaded gasoline in soils, mining wastes, old insecticides and microtrash.” While it is true that there are other potential sources of lead in the environment, to date no published scientific data shows another credible pathway of exposure from sources other than ammunition for the vast majority of the cases. 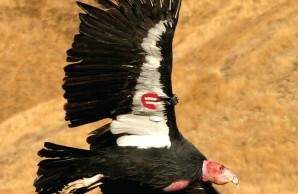 From 2002 to 2011, the Santa Cruz team analyzed the blood-lead data collected on 110 free-flying condors by the Condor Recovery Program, and about 80 percent of the birds were found to have lead isotope signatures (ratios of two naturally occurring stable lead isotopes that are often characteristic of a particular source) that were consistent with lead-based ammunition or fragments, whereas only five condors were found to have blood-lead signatures consistent with lead-based paint. The latter was traced to legacy lead paint peeling off of an old fire tower. There was no evidence that any of the 110 tested condors were significantly affected by lead from legacy leaded gasoline in soils or microtrash. A California condor sits next to its thirty-day-old chick in a cave nest near Hopper Mountain National Wildlife Refuge, northwest of Los Angeles, California. Using population models, this team also showed that the condor’s apparent recovery thus far is largely due to the release of captive-reared individuals and intensive, ongoing management efforts (costing roughly $5 million per year). 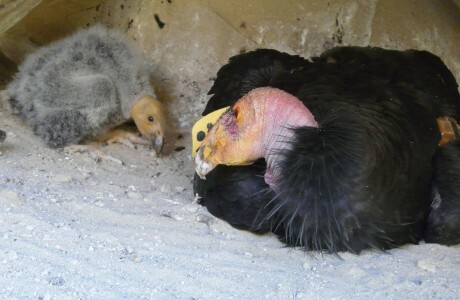 According to Finkelstein, continued exposure to harmful levels of lead-based ammunition is preventing the self-sustained recovery of the condor population. The Arizona Game and Fish Department has also identified lead toxicity as the leading cause of death in condors in the Arizona reintroduction program. Chris Parish, the nonprofit Peregrine Fund’s condor reintroduction project director, who was involved in the reintroduction of condors to northern Arizona beginning in 1996, believes that lead poisoning from lead-based ammunition is the most significant challenge to the recovery of California condors in northern Arizona and southern Utah, especially during and following the deer-hunting season. The NRA and other hunting organizations claim that non-lead ammunition is less accurate, more expensive, and/or not as easily available as lead-based ammunition. Conservationists dispute those claims, pointing out that the U.S. military has already converted two of its standard calibers to nonlead bullets, which both testifies to the efficacy of nonlead ammunition and should lower its cost. Mike Wallace, a conservation program manager of the San Diego Zoo’s Institute for Conservation Research, who has been involved with condor conservation for the past thirty-five years, feels that the way forward is trying to change long-term hunting traditions and persuade shooters to use non-lead ammunition. Arizona has had a voluntary lead ammunition reduction program in place since 2005, and Utah adopted a voluntary program in 2012. And in 2008 the Ridley-Tree Condor Preservation Act, which authorized regulations banning the use of lead ammunition in California in areas identified as condor habitat, went into effect. The specified areas were narrowly defined, however, and in any case lead-based ammunition remained legally available in all of California, Arizona, Utah, and Baja California. Owing to the huge foraging range of condors and their group feeding behavior, the voluntary programs and the statemandated reduction program, while serving to reduce lead in the environment, were not enough to alter the situation. More recently, Governor Jerry Brown signed Assembly Bill 711 into law on October 11, 2013. This bill makes California the first state to ban the use of lead ammunition for all hunting purposes. The law, vehemently opposed by the NRA and many other hunting organizations and gun-rights groups, was supported by numerous environmental, conservation, and animal rights groups. The ban is not mandated to come into full effect, however, until July 1, 2019. Even then, lead-based ammunition will still be available in the marketplace and legal for range shooting and ranch management activities involving domestic stock. The carcasses of domestic animals could still be legally riddled with lead and be available to free-flying foraging condors and other species of wildlife. And the new restrictions would have little effect on poachers, already operating outside the law. The new law extends the geographic range of the earlier ban to statewide and outlaws hunting with lead-based ammunition. It is not an assault on anyone’s personal liberty. Hunters can still hunt. They are not being stripped of either their guns or their lead-based ammunition. Nor is this law a conservationist’s panacea. Yes, it will probably reduce the amount of lead in the food chain. But, as John McCamman says, “even a little lead can cause a lot of damage.” The Santa Cruz team found that “over the course of ten years, if just one half of one percent of carcasses have lead in them, the probability that each free-flying condor will be exposed is 85 to 98 percent, and one exposure event could kill a condor.” So, even if just a few people use lead-based ammunition, there may still be enough contaminated carcasses to cause lead poisoning in a significant number of condors. As long as lead-based ammunition is freely available, there remains an ongoing problem for the condors and the environment. I feel privileged to have seen a free-flying California condor. Those working to restore these birds to a self-sustaining place in the wild remain optimistic that the reintroduction projects will eventually prove successful. I hope they are right. It would be a shame if generations to come could not sit on a cliff overlooking Big Sur and see a condor soaring in the distance.